We are having many programming languages in the technical market to learn regarding the software field. Year by year they are many programming languages are introducing. Prior languages or traditional programming languages are updating same versions or else new versions will be released. Do you know what programming languages companies like google and Facebook are using? Students usually in dilemma with this pool that have a question in mind like “Which language we need to study?” Here you are having answers to all your questions in your mind. Here in this posting, you will come to know that the Top 10 Programming Languages which are the best, you can learn in this year. By taking into the consideration stock flow, MNC tactics, freelance market, and future trends. By studying all the leading programming languages and made the list of programming languages that are going to float upcoming year. These below Top 10 Programming Languages have the tremendous scope and have potential to drop you a great job. Java is one of the most practical languages. This one of the most popular courses in this Top 10 Programming Languages. The majority (90%) of the companies use JAVA programming language to develop backend systems and as well as desktop apps. This is 20 years old, used by millions of developers and billions of devices worldwide. It’s highly portable as it boasts the cross-platform compatible Java Virtual Machine (JVM). JAVA reinforces OOP (Object-oriented principles) including with C++, Perl, Python, and PHP. Server-side apps, video games, and mobile apps can be created in JAVA. JAVA is the core programming language of Android Apps and having huge popularity. Java Enterprise Edition 8 and Java 9 both launched in September 2017 as the Eclipse Foundation took over managing Java EE from Oracle. The fastest growing programming language. Python grew in popularity by about 5,000 job postings over 2017. Python is similar to PHP and Ruby in the sense that it is an object-orientated language. The general-purpose programming language used for web development and as a support language for software developers. It’s also widely used in scientific computing, data mining and machine learning. The Python programming language is freely available and makes solving a computer problem almost as easy as writing out your thoughts about the solution. The code can be written once and run on almost any computer by reusing it. Python is the futuristic language and your career booster. Sites like Instagram, YouTube, Reddit, and NASA use programmed in Python. It’s often used as the foundation of CMS’ (Content Management Systems) like Word Press and big websites like Facebook and Wikipedia. PHP, a scripting language used on the server side. For web development, most of the developers use PHP either to add functions or to interact with MySQL databases. For popular content management systems, this is used. For web development as it’s mainly a server-side scripting language, forming the base of both Word press and Facebook. RUBY is 5 times more in demand than Python, and one of the fastest growing programming languages, seen only in Java for the most projects completed. In fact, Ruby is so easy to use you can create an app in it in under 10 minutes. Group on, Airbnb, Pxlr, and Bloomberg are all coded in Ruby, as well as many more. Ruby operates as a dynamic, object orientated because it reads like English, it makes the code easy to read. It’s needed to maintain code databases for many high-end websites, so Ruby’s demand is increasing, so much. So that it’s become common within DevOps roles, i.e. the engineers ensuring the reliability and efficiency of the servers running websites with high traffic. Depending on your company’s needs, this could be the one for you. The reason why Ruby on Rails is a great and popular choice is that many businesses (small and large) make use of it. Some businesses are Airbnb, Group on, Twitter and Shopify. Sites that use Elixir are Pinterest, Moz, and Bleacher Report. Rust came in first place in 2016 the Stack Overflow Developer Survey for what developers loved most (79.1%). Indeed, new developers love Rust language very much. Rust popped up as the programming language developers. Developed by the Mozilla Foundation, the open source Rust programming language operates as a low-level language, suited for performance critical code. About RUST is that it emphasizes safe code (i.e. the objects are managed by the programming language from beginning to the end). It’s also the most loved programming language on Stack overflow for 2017 which says a lot. Sites that use Rust are Dropbox and Coursera. Google created Go (or golang). It compiles fast and it has an excellent standard library that is also great with concurrent programs as well. Sites that use go are Netflix, YouTube, and Adobe. C# (‘see-sharp’) is up to Microsoft framework. It’s also used for Windows applications and Android/iOS Apps with the technology from Xamarin. C# is having very cool features as the gaming industry is swapped with the C# features and this language. But, according to other programming languages, C# has gradually decreased. It will be more benefited to learn this C#. The above are the Top 10 Programming Languages according to the recent study. 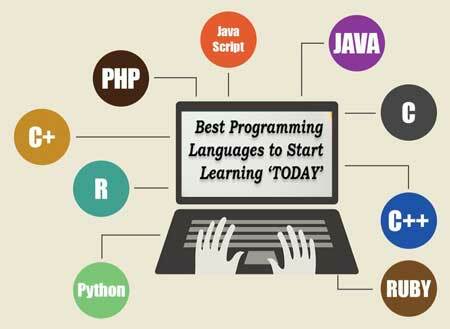 Choose the best one of your interest in the above programming languages and hike your career growth.